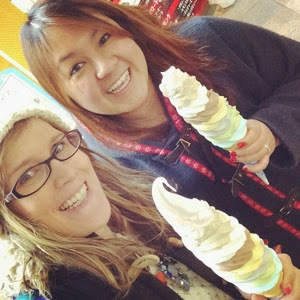 After months of planning and some sort of trouble happening along the way and having to reschedule, we finally made it to Nakano Broadway's "Daily Choco" shop. Located in the basement floor of Nakano Broadway, famous for its manga, anime and action figurines. The shop only being a counter with no seats, it's typical to see people just standing around the shop eating their ice cream. But we were lucky, there was hardly any people around on a Monday afternoon, and in winter. 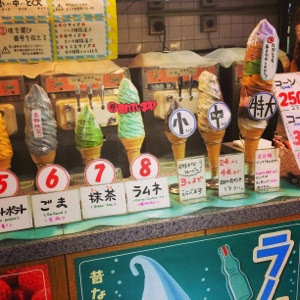 The shop is famous for its "tokudai soft ice cream", it has a tower of 8 flavors of ice cream, priced at 440 yen. 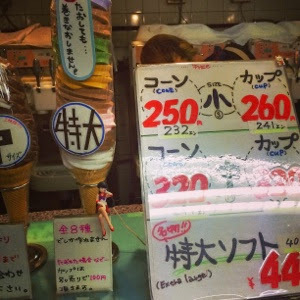 It used to be 390yen but because of the bad economy in Japan, prices have raised. 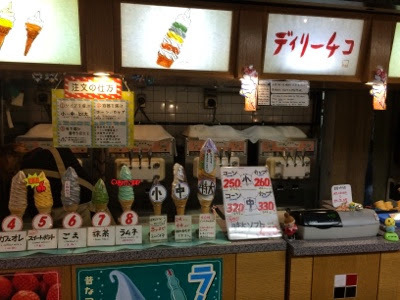 It seems that their flavors change often after searching through many japanese blogs, but this time there was strawberry, caffe latte, chocolate, sweet potato, sesame seed, green tea, ramune (fizzing candy) and vanilla. You can get all the flavors, or ask for a special order, I saw on a blog one girl had chocolate, strawberry and vanilla mixed to the same size as the "tokudai". It seems they are very flexible and if there is a flavor you don't like, you can change it. 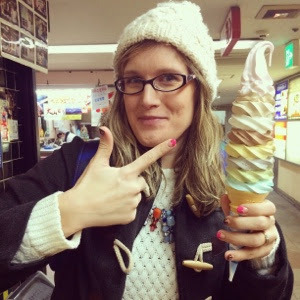 They also offer small and medium sizes, but it's fun to see if you have the stomach to eat this massive tower of soft cream and it's well worth it's price! I can tell you, we could eat it with no problem!